An IPwars first: my colleague, Susan Gatford, provies an update in which a Full Court overturned an interlocutory injunction against an alleged patent infringement. Do you agree with Sue that a trend seems to be developing? Remember way back at the start of the Apple v Samsung litigation the Full Court dissolved the interlocutory injunction granted to Apple? Well, they did it again earlier this month in GlaxoSmithKline Australia Pty Ltd v Reckitt Benckiser Healthcare (UK) Limited. It was designed by Reckitt and called a flat nosed syringe (i.e. one without a nozzle). It fits into a plastic attachment inserted into the neck of a medicine bottle. The syringe fits tightly into the neck attachment and allows accurate dosages to be measured and then administered. 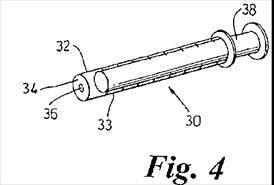 Reckitt has patented its bottle-syringe-bottle neck arrangement. It uses it to sell nurofen for children. This has apparently given their nurofen product a substantial competitive advantage over Glaxo’s panadol (the medicines are largely interchangeable and parents chose the one that is easiest to use in terms of dose measurement and child acceptance). Two injunctions were granted. 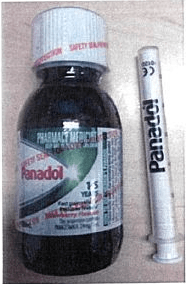 On 28 May 2013 a Glaxo product that substantially replicated the Reckitt product was injuncted. According to the Court’s reasons Reckitt’s only complaint was the similarity of the bottle neck liner. This wasn’t, however, only what the patent claimed as its invention (remember, the aim was to design a syringe that didn’t look like one). A liquid dispensing apparatus comprising a bottle, a bottle neck liner and a flat-nosed syringe having a plunger and a barrel, the barrel terminating at its distal end in a generally flat face having a diameter corresponding to the diameter of the syringe and being perpendicular to the longitudinal access of the barrel…. would be understood by an addressee skilled in the art at the time of the patent to apply to the distal end of the barrel. Accordingly, his Honour held that Reckitt had a sufficiently strong prima facie case that warranted the grant of an injunction. His Honour rejected Glaxo’s application to lead further evidence as to the balance of convenience and made orders restraining the sale of the re-designed product. Glaxo appealed. It was, of course, a matter for the primary judge to make findings of fact based on the evidence before him. But having made strong findings of fact, which were directly contrary to Ms Tomkins’ first affidavit, in the context of assessing the balance of convenience at the first hearing, it is difficult to understand why GSK should be prevented at the second hearing from relying upon additional evidence from Ms Tomkins in the form of her second affidavit which expanded upon the reasons why the primary judge’s suggested option was impracticable and posed public health and safety risks (see further below). All the more so in circumstances where the second hearing took place more than six weeks after the first hearing and related to an allegation of patent infringement in respect of a different apparatus. These considerations are not displaced or diminished by s 37M of the FCA Act. 3. it is worth paying very careful attention to balance of convenience evidence, which is often a moving feast, and doing your best to make sure that the Court does too. Referring the Court to this case might just help in that endeavour. Susan Gatford is barrister on Gordon & Jackson’s list at the Victorian Bar. She practices out of Owen Dixon Chambers in Melbourne and is also a registered trade mark attorney. Reckitt Benckiser Healthcare (UK) Ltd v GlaxoSmithKline Australia Pty Ltd  FCA 583 (Reckitt (No.1)) at . ? Reckitt (No.1) at . ? Reckitt Benckiser Healthcare (UK) Ltd v GlaxoSmithKline Australia Pty Ltd (No 2)  FCA 736 at . ? Next ArticleWhen do 4 stripes infringe 3?